Rewind to last Saturday afternoon, and the first part of Hungary's qualifying session. Lewis Hamilton was out; Pastor Maldonado was out - both victims of technical maladies ending their sessions before setting a time. The remaining four of the six drop-out slots would therefore surely be taken by the 'B class' of two Marussias and Caterhams each, given they appeared way off the back of the pack as usual. This even with the soft tyre looking much quicker than the medium that all of the haughty A class had set their times on. Cool your jets in the garage and save the softs for the next part. But there was a tiny flaw in these best laid plans. That flaw being they reckoned without Jules Bianchi. 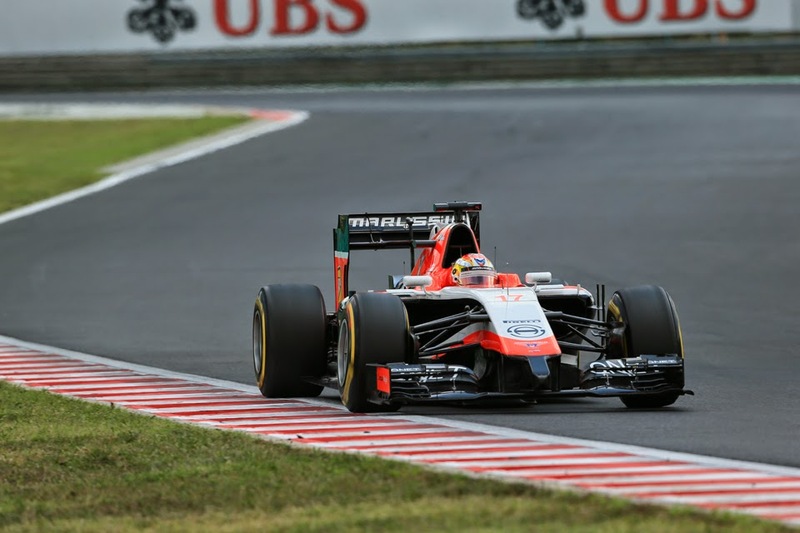 At the very last he put his Marussia on its end and grabbed the final spot to get into Q2 of P16 all for himself. Further it was the revered scalp of Ferrari and Kimi Raikkonen - straggling at the back of the A class - that was bagged. We can criticise Ferrari for a misjudgement - and indeed plenty have - which gave Bianchi his opportunity to pip one of its cars, but looking at the lap times one can begin to see perhaps why the squad's supposedly very clever people were caught out. Put simply the prodigious Frenchman pulled a rabbit out of the hat. But even with this Bianchi's 1m 26.7 that got him into the quali hour's second part was a full 1.1 seconds faster than his previous flying lap set a few minutes earlier. By way of comparison, Kamui Kobayashi who had been ahead of Binachi after their first efforts improved by six tenths. The prodigious Frenchman concurred when I asked him later if he thought it was a perfect lap: 'yeah, I think it was one of the best laps I've done in quali, so I'm really happy'. And a lot like Valtteri Bottas last year, Bianchi more generally in 2014 seems to be developing a crucial knack of in a modest car seizing the rare opportunities to be noticed when they come along, this on the Hungaroring Saturday being but the latest example. 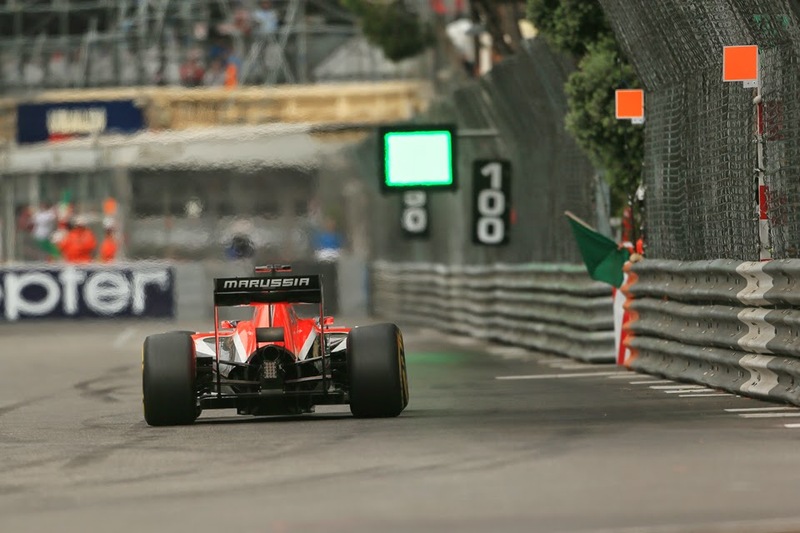 In Monaco where he was quick throughout he of course finished ninth - eighth on the road - despite a grid penalty as well as adding five seconds to his solitary pit stop unnecessarily. 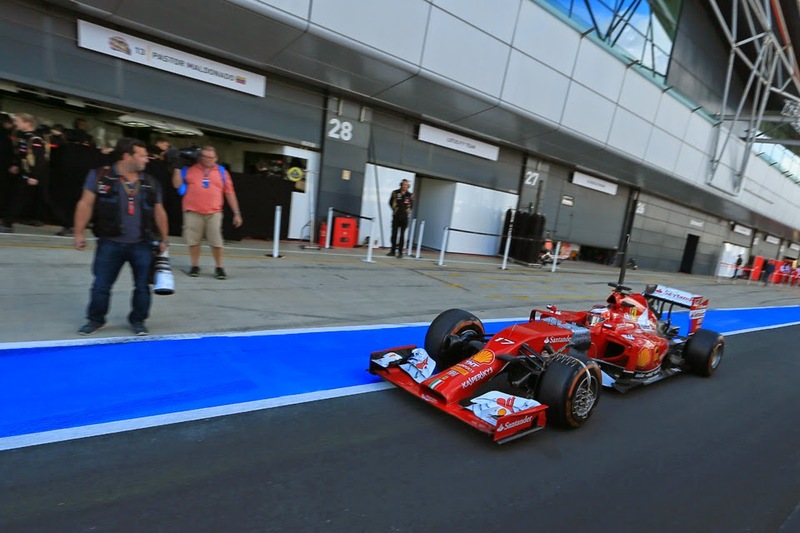 In Silverstone in difficult conditions he qualified in P12, aided by others goofing up but the laps Bianchi banged in to get there were excellent; in Q1 about 0.9 seconds faster than team mate Max Chilton and in Q2 1.1 quicker. It can't have harmed him either that Bianchi's best mark that day just so happened to be quicker than anything the race seat incumbent Kimi Raikkonen had managed in the race weekend just preceding it - a 1m 35.2 when Kimi never got within half a second of the 35s even (though slightly tempered by FP3 and quali being run in the wet). And of course - once again proving that the governor of F1 fates is one possessed with a wicked sense of irony - his Hungary feat was as mentioned at the expense of the same Kimi Raikkonen, dumped out in Q1. The same Kimi Raikkonen that has been struggling this year. At the same Ferrari team that Jules is a member of the young drivers' programme of. Inevitably it all got rather a lot of speculation over Bianchi and Ferrari getting together in a race seat perhaps sooner rather than later. The man himself afterwards was coy, but still made it clear that he considers himself all-set to step in. Growing your own in terms of young drivers and allowing them to sprout all the way to a full-time race seat is quite the F1 vogue these days. We of course have Daniel Ricciardo working wonders at Red Bull, rather against expectations. We also have Valtteri Bottas really blooming at Williams, Kevin Magnussen is showing some promise at McLaren, and lest we forget down Woking way there is also the recent example of Lewis Hamilton. Of course it doesn't mean just any product of a young drivers' programme should be lobbed in. Yet Bianchi's also showing us with reasonable regularity that he isn't just any product. As for Ferrari? Historically the Scuderia's selection of drivers has tread a rather curious middle lane. On the one hand - whatever the current line up - the team has tended to prefer to create champions rather than sign them. Raikkonen is only the fifth world champion it has recruited ever (Alonso, Schumacher, Prost and Fangio being the others). But by the same token Ferrari has also viewed racing there as not the job for a boy. Which may yet count against Bianchi in the short term. The last driver to make his F1 debut in a Ferrari by my reckoning is Arturo Merzario, all the way back in 1972, and in his case he was pushing 30 at the time of the Commendatore's call. Senior figures in the team have noted before that the pressure of a Ferrari drive isn't matched by anything else - and Ferrari may consider Bianchi's two seasons at the back as not enough of a basis. Granted, Bianchi is right now about the same age as Felipe Massa was when he debuted in red in race seat (as well as older than Niki Lauda was when he was thrown in...), but by that point Felipe had three seasons in a Sauber to his name as well as a year very much ensconced - in the days before such things were restricted - as a full-time Ferrari tester. Is Bianchi striding into the Ferrari picture? Looking for similar examples from the past down Maranello way is not the work of a moment. Stefan Johansson got a full-time Ferrari drive in 1985 with but a patchy F1 CV at that point made up of struggling with tail end teams, often not qualifying, scattered across several years. In the previous campaign things had picked up ever-so marginally with three end of season races in midfield for Toleman, including a fourth place in Monza as well as threatening to deprive Lauda of his third world title by holding him off for several laps in the final round in Portugal. He went on to be a respectable Ferrari performer. But then again that opportunity came about in unusual circumstances - incumbent Rene Arnoux sacked amid mystery but a single race into that 1985 season. The next apposite parallel that comes along from working backwards through time is provided by a certain Gilles Villeneuve, snapped up by Ferrari after but a single (if impressive) F1 outing for McLaren. From what I can tell that one worked out well. But still, my lingering suspicion has been that Ferrari will likely be minded before sticking him in the big seat to give Bianchi a year in the midfield first, and perhaps let Kimi run down the final year of his contract next campaign (which has the auxiliary bonus of not having to face to embarrassment of sacking him for a second time). 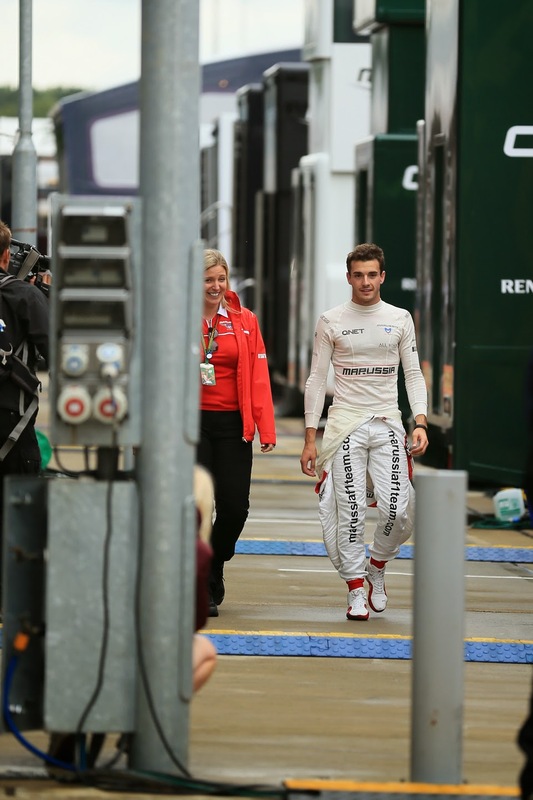 To throw Bianchi in directly out of a Marussia remains rather against history. Sauber's often been willing destination for this sort of thing (see Massa, Perez), although its fairly well-documented financial troubles may make it difficult. Ferrari will likely need to offer a financial sweetener, the most obvious avenue would be via its engine deal. But whatever is the case, if Bianchi keeps on performing then surely in the course of time nothing will stand in the way of this young driver whose time has come getting the opportunities he merits.